As many of us may have realised in the past 48 hours; Winter is here! And, as much as I’ve heard (or participated) in a moan or two regarding the difficult task of rising out of bed, I am pleased to announce that winter on Straddie means one thing: WHALES! 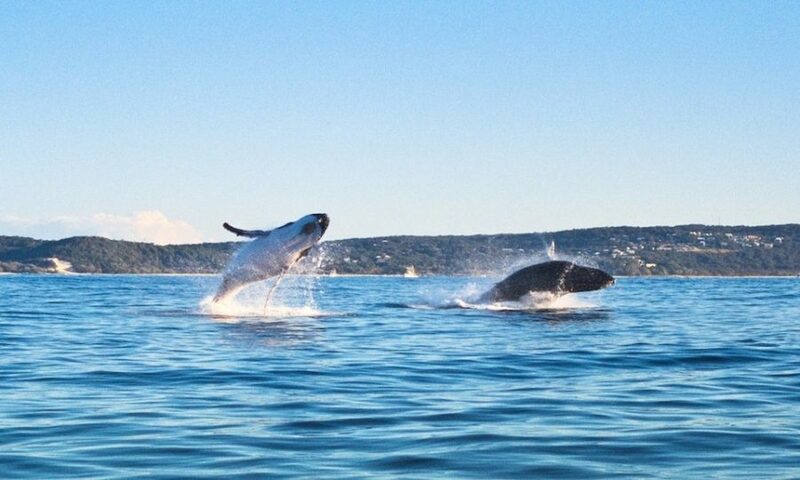 If you know anything about North Stradbroke Island, you would know that we LOVE whales. Like, a lot. Love. Whales. So, so much… Whales. WHAAAAALES!! Yes Micheal Cera, it IS happening. 1. The ‘Point Lookout Whale Show’ is spread over three spectacular acts; each as impressive as the last! Point Lookout may provide the oceanic stage for Humpback Highway, but don’t expect each encounter to be the same as the last. Our whale season ranges from May to November during which our three dance acts take place. The first act takes place during the early months of the Northern Migration where all the single whales attend ‘red light green light’ mixers, think ‘Tinder’ on a baleen scale. Lots of romantic tail slapping, alpha blows and plenty of totally macho breaching from our male humpbacks as they try and show the mumma whales what they’re missing out on. The second act features cute, playful and curious calves clinging to their mothers in the early weeks after birth. During August and September, many of our doting mother humpbacks commence their journey home, much to our delight as we get to witness pint size (4m long) baby whales rise vertically in the water to get a good look at their surroundings. Much like humans, humpback offspring remain incredibly close to their mothers in the early months of their life as many aren’t strong enough to keep themselves afloat! The third and final scene of our annual whale show comes from August to November when the boisterous baby calves show off puppy-like strength and playtime antics including lots of breaching (for show of course), tail slapping and tummy flashes! 2. Whales have quite the beauty regime! In a bid to rid their bodies of pesky barnacles (which can weigh a whale down by over 200kgs! ), many whales breach as abrasively as possible in order to dislodge the freeloaders. Without the flipper ability to scratch off the pests, this breaching technique acts as a form of exfoliation! An interesting side note suggest however that some males use their growth as a weapon when thrusting and challenging fellow male opposition! I wouldn’t want to come up against some humpback knuckle dusters! 3. Peduncle is a word. Like a real one, even in the dictionary. I know what you’re thinking; peduncle is not the colloquial term for a pervey distant relative, it is in fact, the name given to the karate-chop style action of a whale when you get a little too close. It’s hard to believe something so big can ever feel claustrophobic but when your home is the ocean you can forgive a whale for getting a little uncomfortable when we get too close. Peduncle describes the action when a whale, moving headlong through the water freaks out at the last second, rotates sideways and then crashes, like a huge belly flop, into the ocean. You can imagine that witnessing 12 tonnes of blubber eject itself that suddenly into the air can be quiet an incredible sight to see! 4. Whales are the Eagles of the ocean; always watching. Ever wonder how, with the entire ocean at their disposal, a whale will approach a kayak or boat? Their not only alerted the the world around them (on the surface or below), but are also attracted to boisterous movement! So next time there’s an obnoxious child waving their arms around on your tour boat, keep in mind they’re actually doing you a favour. 5. Whales can hold their breath for 40 minutes. No you’re not crazy, ever watch a whale blowing or tail slapping and then swear, somehow it completely disappeared on you? As it turns out, whales have a highly efficient breathing system that allows them to absorb up to 90 percent of the 200 litres of oxygen they inhale, compared to the measly 15 percent that we have. They can also slow their heartbeat and constrict select arteries allowing them to dive for long periods of time. Want to know more about Point Lookout’s Humpback Highway than is provided here in my Stradbroke Island Blog? Discover Stradbroke and Fishes at the Point are teaming up once again to host guided, land based whale tours with a marine biologist! Tours are running twice daily from June 27 – June 29 and are suitable for children aged 5 and above, as well as adults. Contact Fishes for more information on 07 3415 3444.